They're about average in thickness, with wide ripples. The amount of vinegariness varies quite a bit from chip to chip, ranging from fairly vinegary to barely vinegary at all. They leave a lot of salt and a little grease behind on your fingers. They taste good. Smell test: Good vinegar smell, with some zing. 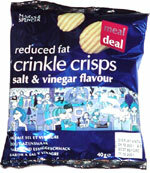 This snack was discovered by Jeremy in York, England.